We get up at lunchtime then I head to the paper shop with Doggo before meeting L and MD on the park. L then cooks up a full English while I breathe some life into the ailing computer. I tried to get on the track this evening but apparently there isn’t a session this week as some paracycling is on. Whether this is watchable or not I’m not sure as nothing has been advertised. I have, at least, provisionally booked for next Sunday. Instead we head over to Derby to Quad where they have Denial showing a week ahead of Broadway. 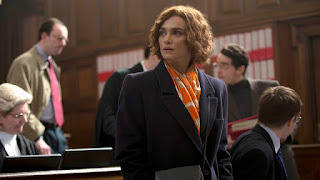 Denial is based on a 1996 legal case between Deborah Lipstadt (Rachel Weisz), an American professor of Holocaust Studies, and the historian David Irving (Timothy Spall). Irving sues Lipstadt over her book ‘Denying the Holocaust’ in which she accuses Irving of being a Holocaust denier and falsifier of history. The trial is held in Irving’s native England where the burden of proof is with the accused not the accuser. Basically she has to prove that the Holocaust happened. Easy right. Not so. Lipstadt, a runner and a dog lover (so you have to like her), engages a top legal team to fight her case. This actually means that she doesn't in the end have to prove anything as her legal team totally take over. So she can pretty much get back to her running and dog walking for the next few years as the process rolls along. In fact solicitor Anthony Julius (Andrew Scott) and barrister Richard Rampton (Tom Wilkinson) treat her more like a naughty child than the one accused. 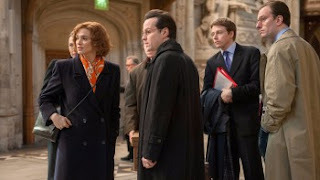 They quarrel about how to approach the case with Lipstadt wanting to take the stand herself and bring in Holocaust survivors to testify while Julius prefers to simply present the facts. So off they go to try to find proof of the gas chambers at Auschwitz-Birkenau. 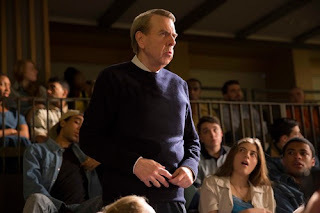 Denial must have been a tricky film to make when you consider the topic, the potential for emotional bias and the fact the majority of the viewers either knew or could accurately guess the outcome of the trial. Which does not leave much scope to build meaningful tension but overall I think overall they did a decent job. In court, Irving, serving as his own lawyer, has an answer for everything but not usually a very convincing one. So things progress as you would expect and hope until Mr Justice Gray (Alex Jennings) throws the defence team slightly off balance when he asks whether Irving might not actually be lying as they claim, if he genuinely believed the Holocaust didn’t happen. It is the one moment of ‘almost tension’. Denial is easy to watch, informative but perhaps just lacking that vital dramatic spark that would have made it great. Afterwards we drop into the pub formerly known as The Chequers in Stapleford which is now called the Old Rock but is normally a no go area due to its seemingly constant karaoke. They are now serving four real ales and are promoting this fact with a Real Ale Weekender. All their ales are local ones apart from their regular beer which is Doom Bar. Nought out of ten for imagination there then. I do have a decent pint of Scribblers but it’s nothing I can’t get elsewhere. They are going to find it very hard to compete with the constantly impressive range across the road at the Horse and Jockey but good luck to them. I will pop in again sometime.